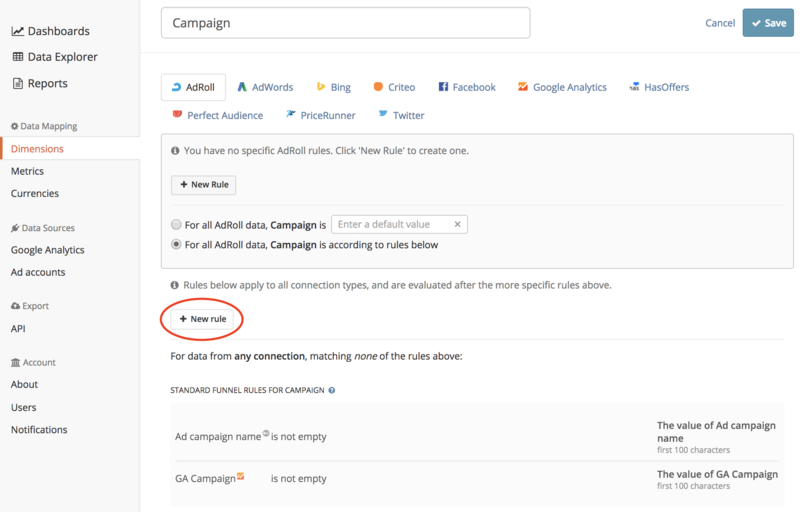 If you use filters in Google Analytics to force all utm-tags into lowercase you can do the same for your ad campaigns in Funnel to match the data on a campaign level. To match the data from your ad platforms with the data from your Google Analytics account on a campaign level the ad campaign name needs to be exactly the same as the utm_campaign tag. If you use a filter in Google Analytics to force all utm-tags into lowercase the ad campaign name and the utm-campaign tag will never match. To solve this you can select to force all the ad campaign names into lowercase. Navigate to Dimensions (found under Data Mapping in the left list) and click the default dimension "Campaign". Then click Edit in the right corner. 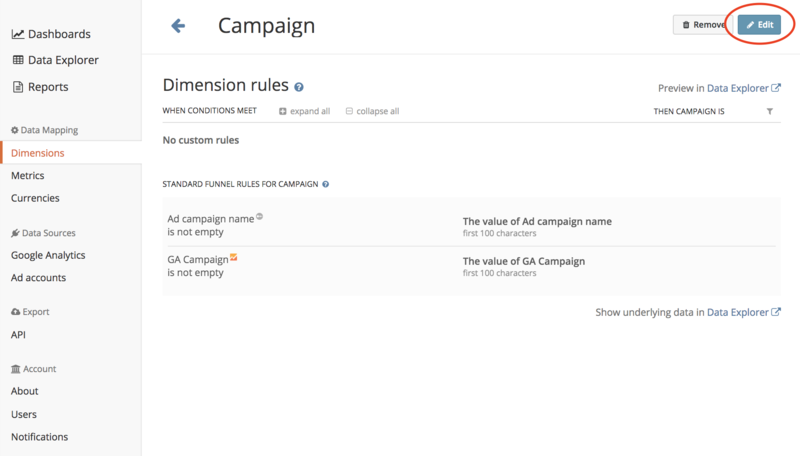 In order to override the existing Standard rules and force the Ad Campaign name into lowercase, create a common rule by clicking + New rule as shown in the picture below. The rule that you want to create should pull all the different values from Ad Campaign name (when they exist) and set the Campaign to the value of Ad Campaign name. Note that your account might not have an 'Ad campaign name' dimension. If that is the case you can create one from a template. When Ad campaign name is not empty, then Campaign is the value of the the Ad campaign name lowercase. This rule applies for all Connections in your Funnel account. Lastly click Save in the top right corner.